Information contained on this website is for educational purposes. The authors do not endorse products or positions described by the organizations who are linked to this website. Where Can I Get My Drinking Water Tested? Purdue University's Extension Office has a good website for that information. Michigan State University's Extension Office also has good information here. I'm Buying a Property. Should I Test the Drinking Water Before Buying It? Just because a building receives water from a municipal water system doesn't mean the water in the building will be safe. Also, just because a home has used water from a private source (i.e., well, creek, etc.) for years does not mean the building water system will be safe when you buy it. To be certain, before you buy a home, test the drinking water appropriately. Inspect the plumbing. Know what you are buying. For water testing, test for bacteria (using the Enumeration test - not Presence/Absence test), inorganic contaminants, total organic carbon (TOC), and other inorganic contaminants. Make certain the water samples are not collected after a home treatment device like water filter on the kitchen sink tap. Otherwise your water sample will evaluate the water filter on that faucet not the water that you would be exposed to in the shower or another part of the building. [Personal Story: This happened to one of the researchers who thankfully saw the technician was taking a water sample in the wrong place and stopped them.] Find out if the building has a lead or galvanized drinking water pipes. Some States do not require the Owner to tell you. You should have the water tested for lead, zinc, copper, iron, and other heavy metals, even if the Seller ad Realtor tells you not to worry. The Buyer must be proactive in water testing decisions. It is good practice for the Buyer to determine if the drinking water is safe on a building they are about to purchase. What Water Pipes Should I Choose? Which are the Safest? The answer to your question seems to be location specific and sometimes drinking water specific. The water that runs through the plumbing pipes can influence which chemicals leach out, how much chemicals leach out, and if organisms like bacteria can grow in building plumbing. Through this project and other projects we have ongoing, we are looking to determine what drinking water and pipe characteristics need to be considered when selecting the right pipe for your building. Have You Conducted Any Testing of Plastic Drinking Water Pipes or their Safety? 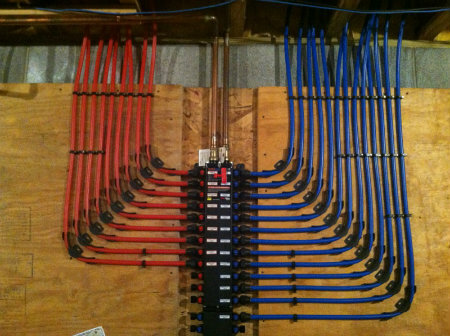 The image below shows a crosslinked polyethylene (PEX) manifold installed on a wall in a single-family home (in their basement). Red pipes convey hot water and blue pipes transport cold water. PEX piping systems can also be designed as trunk-and-branch design, without a manifold. Why Does My Drinking Water Smell? The water company adds a disinfectant chemical(s) to your water to prevent bacteria from growing and that chemical has an odor. As the disinfectant chemical added by the water company traveled to or within your building it was converted into other chemicals. The other chemicals are present at a concentration that allows you to detect an odor. Chemical(s) that are causing the odor were present in the water that entered your building all along, but the disinfectant chemical that has an odor disappeared and those underlying chemicals can now be smelled. Chemical(s) that cause odor leached out of parts of your plumbing such as pipes, gaskets, tanks, etc. and entered your drinking water. Bacteria in your plumbing converted chemicals in your drinking water (that do not have an odor) to other chemicals whose odor is noticeable. For example, this can occur when water contains sulfur. Bacteria can convert sulfur to a rotten-egg odor. Should I Use Hot Water from My Faucet to Drink or Cook With? No. Read this article from Grist.org to learn some reasons why you should NOT use hot water from your faucet. Drink cold water and use cold water for cooking (after you heat it up on the stove, etc.). What Drinking Water Plumbing Safety Actions Can I Take Right Now? What temperature should I set my water heater at? Savings Project: Lower Water Heating Temperature. What are Known Defective Plumbing Products? Polybutylene (PB) Pipes The image below shows defective PB pipes removed from one of the researchers homes. These pipes were involved in a class-action lawsuit.